Can jared kushner be put out of his misery? At this point, it seems like everyone on Earth would benefit if Kushner left the swamp. Assessing his exit options. Kushner heads to a meeting with Trump and Qatar's Emir Tamim bin Hamad al-Thani at the Palace Hotel on September 19th. Amid a horrific week, let us look away from the front pages and return, as a diversion, to Jared Kushner, a quiet but exceptionally incommodious presidential relation who should, for the good of the world, stop doing anything work-related, political or commercial, maybe forever. To be sure, bigger and more dangerous things are happening out there, and Kushner’s an easy target, with a fanbase that’s restricted to G.O.P. donors, leak-receiving journalists, and Lindsey Graham. I know that an attack on Kushner by this publication only helps the man. 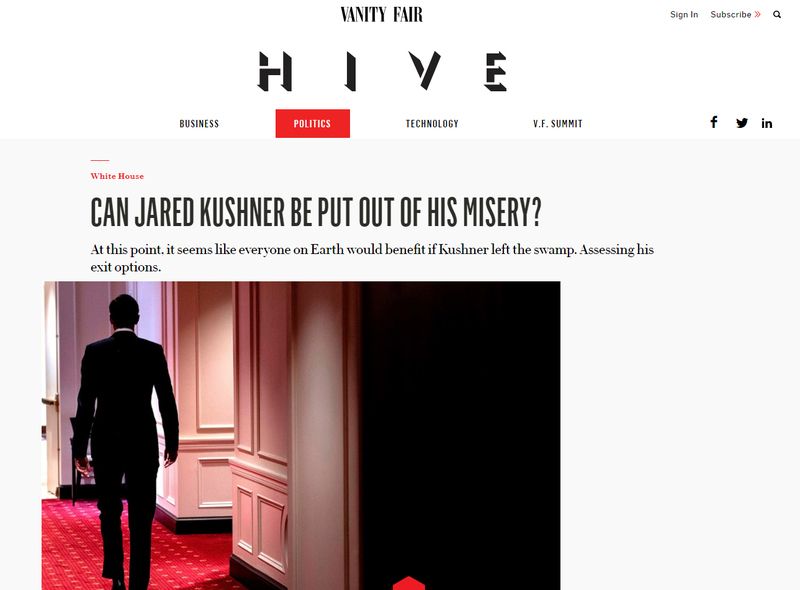 But everything we learn about Jared makes him look worse and worse, and the sooner he’s back in New York, the better for everyone.